Macuha Art Gallery holds a National Painting Competition with the theme, "Kayganda ng Pilipinas: Bakit Laging Binabalik-balikan." Trophy prize is a sculpture made by Aris Bagtas. 1. This painting competition is open for both REPRESENTATIONAL & NON-REPRESENTATIONAL categories. 2. For the painting categories, the required size is 2 feet x 3 feet, horizontal orientation (LANDSCAPE), gallery or museum wrap, READY TO HANG. The acceptable media are: oil on canvas, acrylic on canvas, mixed media and watercolor. Water color should be properly framed. 3. The frame/stretcher must not exceed 4 kilos, and must be 2 inches on all sides. 4. Painting must be an original work of the artist and never been exhibited. 5. The artist must sign the artwork. Entry form must be notarized. 6. Note: Addendum to this rules and regulations will be posted before the submission of artworks. 8. 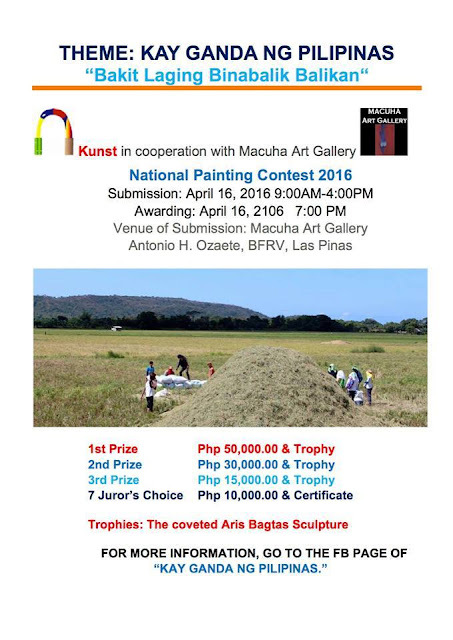 WAIVER: ALL WINNING PAINTINGS INCLUDING THE JUROR’S CHOICE WILL BE THE PROPERTY OF MACUHA ART GALLERY. Venue of Submission & Awarding Macuha Art Gallery Antonio Ozaete Street, BF Resort, Las Pinas.